A trip from London (UK) to New York (USA) takes about the same amount of time as was needed by a spaceship to go from Kazakhstan to the International Space Station (ISS) on March 29. Usually, this trip takes about 2 days, but this time the astronauts zoomed over in just 6 hours. A Russian Soyuz spacecraft took 3 astronauts to the ISS to add to the 3 astronauts who were already living there. Some equipment improvement and a new shortened route helped the spacecraft get to its destination a lot faster. The ISS is a large research facility in space. Work started on it in 1998, and since November 2000, humans have been continuously living on the ISS. It is approximately 220 miles (350 km) from the Earth’s surface. It goes around Earth once every 90 minutes, and it can accommodate up to 6 people. 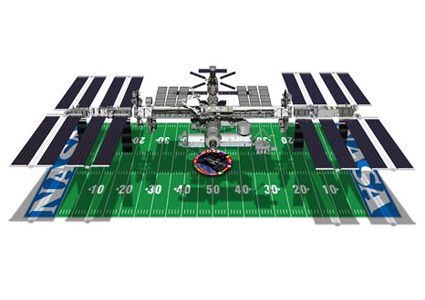 The space station (with its gigantic solar arrays) is larger than an American football field. The area where the astronauts live is about the size of a five-bedroom home with two bathrooms, a gymnasium, and a 360-degree bay window. It is the largest satellite placed by humans that is orbiting Earth, and is big enough to be spotted from Earth. The ISS was the site of the first wedding in outer space – a Russian astronaut got married while he was on the ISS and his bride was in Texas, USA. It was the venue for “the golf shot around the world” – an astronaut knocked a golf ball into space that went around the Earth. An American astronaut, Sunita Williams, ran the Boston Marathon on the ISS tied to a treadmill. To learn more about the ISS, visit this site. Our Universe is a bit older than what we had previously thought. Recently, results from a European Space Agency mission suggest that our universe is closer to 13.8 billion years old instead of 13.7 billion years.